That lasted about one minute. 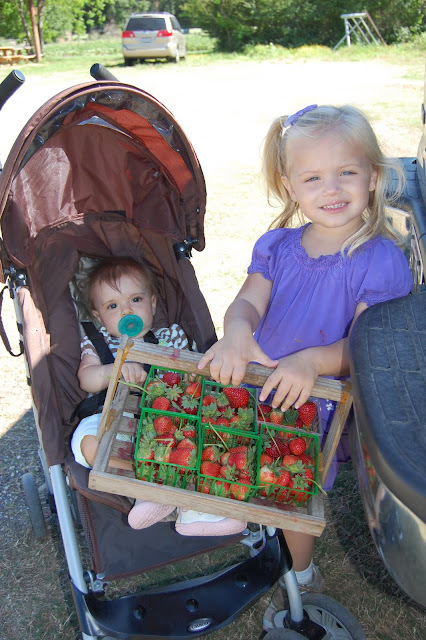 I did manage to get a picture of the girls with the strawberries back at the truck. If you have ever wondered how you can tell if Stella has a fever, look at her eyes in this picture..
Before heading home we also got to make a joyful stop at the outhouse. From now on we will be convalescing at home instead of on field trips. Ugh! I think I talked you right after that day. We have had trips similar to that. Sorry it was a bust. I hope you all enjoyed eating your strawberries at the very least. Way to go for getting out with two kiddos by yourself though! You deserve a pat on the back for that!